"No doubt as a result of her faithfulness, knowledge of the true God became more widespread among their heathen captors. Though not your "typical" missionary story, the narrative of Esther and Mordecai does present some interesting principles that can help us to understand what it means to witness in peculiar circumstances." 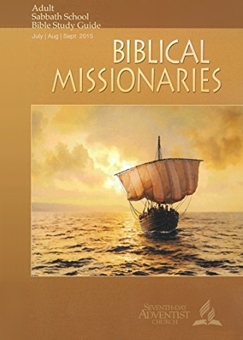 The advertized theme for the quarter is missions. The role of Christian missionaries is to spread the 'good news' of the gospel of Jesus Christ to those who are perishing in their sins and thereby make disciples of Jesus Christ in "all nations", Matt. 28:18-20. It should be understood that the 'Great Commission' of Matt. 28:18-20 applies to all who become Christians. Jesus came into the world for one purpose only which was to die at Calvary for the remission of the sins of the world. All who are born-again of their spirit by Jesus' gift of the indwelling Holy Spirit through his shed blood become 'ambassadors of Jesus Christ' to a world of lost sinners. Our commission is to preach the gospel message of Jesus' death, burial and resurrection for the sins of the world. Certainly we are to care for and attend to the needs of those around us but without the gospel message anything else we do would be like covering over cancer with a band-aide. In this account of the faithfulness of Esther and Mordecai we do see the power of God and his protection of his Covenant People the Jews. However nowhere in the book of Esther do we see where either Mordecai or Esther ever testified, within the context of the Old Mosaic Covenant, the need for all people to repent of their sins and turn to the one true God. As we will see clearly revealed in Friday's lesson, the phrase "to witness in peculiar circumstances" reveals the hidden Adventist agenda of how to promote the 'Great Controversy' theme by following the example of Esther and Mordecai but who are not recorded of having testified of the need for all people to turn to the one true God. "Read 1 Corinthians 9:19-23. In what ways can we apply the principles seen in these verses to what happened with Esther? Or do they apply?" While the Apostle Paul and Esther and Mordecai respectively each lived in empires ruled by an absolute monarch we can see that they all had total faith and trust in the one true holy all knowing all powerful God who is the Creator of us all. However, in the case of Esther and Mordecai, we see this more by their actions rather than their words since nothing is recorded concerning their direct belief and trust in God. Esther and Mordecai could have applied much of the wisdom of Paul's words however he was specifically addressing the local Christians in the City of Corinth which consisted mostly of Gentiles. As present day Christians we can apply Paul's words to our lives in a way Esther and Mordecai would have found totally revolutionary. For us to apply the words of Paul and at the same time compare this with the book of Esther (or vice versa) we must realize that there is a major difference to consider. The account of Esther and Mordecai suggests to us that the salvation they were looking for was limited to the preservation of the Hebrew people. While we are not told what else they must have believed of God's promises they most likely would have also been looking for the return of all Jews to their homeland. Whereas Paul preached the salvation gospel message of Jesus shed blood for the sins of the whole world, Jew and Gentile alike. Today's lesson shifts our attention to John 4:1-26 which in reality has very little to do with the situation that Mordecai and Esther found themselves in. For our commentary we will explore this encounter Jesus had with the Samaritan woman to learn what it does teach us and refer to other New Testament texts as appropriate to understand why Jesus would reveal here that he was the promised Messiah but was not immediately so forth coming with the ruling religious officials until the night he was betrayed. Only our all knowing all powerful righteous God could have and would have orchestrated the events in both situations. However God and the works of God are never once mentioned in the book of Esther even though we see 'the hand of God' in how these events unfold with Esther, Mordecai and the Jews in Persia. Earlier that week on Palm Sunday Jesus rode on a donkey into Jerusalem with the people hailing him as the promised Messiah who they thought would immediately ascend his throne and free them from Roman rule. Instead, on the morning of the night he was betrayed, Jesus declared to the authorities who he was and then shed his atoning blood for the sins of the world before that day was over. Not until that day, according to Good's own timing, was it for the authorities to "know" who he was. In the story of Esther we do not know why Mordecai told Esther to not reveal that she was a Jew. He had no way of knowing or anticipating the events that would soon engulf them threatening their very existence as God's covenant people. What we do know is that when Jesus revealed who he was to the ruling authorities it led to his death at Calvary. When Esther revealed her identity it resulted in the rescue of all the Jews in the Persian Empire. Since the lesson references John 4:1-26, which is the account of when Jesus talks to the Samaritan woman at the well, this is an appropriate time to examine this passage. Jesus and his disciples have departed Judea and are passing through Samaria on their way to Galilee because the Pharisees had heard that more people were being baptized by them than by John (the Baptist). In Samaria, near the town of Sychar, they stop at Jacob's well where Jesus rests while the disciples go on into town to buy food. A Samaritan woman comes to draw water from the well and Jesus initiates a conversation with her by asking for a drink of water. As their conversation develops Jesus tells her that the water he has to offer is such that when you drink it you will never be thirsty again and is water that leads to eternal life. Naturally the woman asks for some of this water, verses 8-15. The woman then perceives that he is a prophet when he reveals details of her life no stranger could have known where upon she says; "Sir, I perceive that you are a prophet. Our fathers worshiped on this mountain, but you say that in Jerusalem is the place where people ought to worship, verses 16-20. Jesus responds by telling her the time is coming when neither place will be where you worship God because the Father is seeking those who will worship him in "spirit and truth", verses 21-24. At this point she says she knows that the Messiah will come and "he will tell us all things" where upon Jesus says "I who speak to you am he", verses 25-26. What we are reminded of in this account is that if you were a Jew who lived under the Old Covenant Mosaic Law the only way you could worship God was to go to the temple in Jerusalem. The gathering together at a local synagogue on the Sabbath for the reading of the Scriptures was a tradition. It was not a command of the Old Covenant and it was not about worship. And, you could only attend for the reading of the Scriptures if you were within a 'Sabbath day's walk', which is another man-made tradition. Otherwise, you stayed were you were and rested on the Sabbath. The Seventh-day Adventist concept of how to keep the Sabbath day holy does not follow the commands of the Mosaic Law. Rather, it is patterned somewhat after man-made Jewish traditions. Christians are to worship God in spirit and in truth. Our rest is not about a certain day because Jesus is our Sabbath rest. The irony here is that this lesson is intended to be about missionaries. The Samaritan woman becomes a missionary when she testifies to others that she has met the Messiah. Yet the lesson for today fails to bring this example of a missionary to our attention. Day Four, Tuesday, Aug. 4: "For Such a Time as This"
The lesson states that Mordecai, in accordance with Jewish law, refused to bow down to Haman. The lesson claims that 'to tear you clothes, put on sackcloth and ashes' was a "Jewish religious" ritual. The lesson draws attention to Esther's breaking of royal Persian law by entering the royal court without an invitation from the king. While it is a proper assumption that Mordecai lived in accordance with Jewish law we must not put into the text what has not been said. In the book of Esther it does not state why Mordecai refused to bow down and pay homage to Haman in compliance with the king's command, Esther 3:2-4. While rending your clothes, putting on sackcloth and covering yourself with ashes was a practice understood by Jews it was not unique to just the Jewish people. Job who we have reason to believe was not a Jew did so, Job 16:15. So did the people of Nineveh when they repented of their sins, Jonah 3:4-6. Yes Esther was a breaker of Persian law but she fully accepted the possible consequences for doing so. If the king did not extend the golden scepter she was prepared to die in compliance with this law when she stood in the inner court of the king's palace without an invitation. This acceptance included "and if I perish, I perish", Esther 4:16. As for 'prayer' it was only Mordecai and the Jews with him who were 'fasting and in prayer'. The biblical text only says that Esther and the young women with her 'fasted', Esther 4:16-17. The Ellen White quote goes beyond this by claiming Esther and the women with her did the same (as Mordecai) when she said; "by fasting and prayer and prompt action, met the issue, and brought salvation to their people". It should also be pointed out that the deliverance of the Jews was a 'salvation' that is not about the remission of the consequences of sin, which is only through the shed blood of Jesus Christ. The two banquets of Esther's brings us to the turning point of this crisis. The schemes of Haman are undone. Evil is exposed for what it is. Credit is given to Esther for having saved her people. Even though God is never mentioned it is obvious that only God could have brought about this incredible victory. The lesson portrays this story as just one chapter in the Adventist fictional concept of 'The Great Controversy' where Satan and Jesus have been dueling each other for eons with one final battle yet to be won by God to vindicate his own character. However, we must remember that Satan's personal fate was sealed the moment he was cast out of heaven. And Satan's power over this fallen world was broken when Jesus died for the sins of the world at Calvary. Concerning the character of God we learn in the book of Job chapters 38-42 that not even a righteous person can challenge the motives and decisions of our all knowing all powerful holy righteous God. It is an arrogant lie that comes from the mind of Satan that God must defend his character before anyone in the universe that he himself created. Satan bruised the heel of Jesus at Calvary but no power of his could keep Jesus in the grave. Jesus' resurrection three days later was a mortal head wound that doomed Satan's plan for the human race. God's victory was assured in the book of Genesis and completed at Calvary. The final battle of the world is really no battle at all in that the outcome has already been determined. Satan will be cast into the Lake of Fire. The Great Controversy Theme is just another of Satan's lies. The events recorded in the book of Esther do not lend support to this theme. As Mordecai assured Esther, if she didn't act their rescue would have simply come from another source. In Esther 8:17 many declare themselves to be Jews. The lesson assumes that those who declared themselves to be Jews were gentile converts. Since the text isn't clear on this point we shouldn't be making observations founded on this belief without qualifying our words. Those who announced that they were Jews could just as easily have been Jews who had been hiding their identity. To be a Jew it takes more than just saying you are a Jew. At the very least the men of the respective families must have been circumcised in accordance with Scripture. No mention is made of this and there is no indication these people had turned to the one true God as the lesson assumes by referencing Romans 1:18-20. "The decree that will finally go forth against the remnant people of God will be very similar to that issued by Ahasuerus against the Jews. Today the enemies of the true church see in the little company keeping the Sabbath commandment a Mordecai at the gate. The reverence of God’s people for His law is a constant rebuke to those who have cast off the fear of the Lord and are trampling on His Sabbath.—Ellen G. White, Prophets and Kings, p. 605." The 'remnant people of God' is a specific reference to Seventh-day Adventism which was founded upon the failed prediction that our Lord and Savior Jesus Christ would return on Oct. 22, 1844. Shortly before Jesus died at Calvary he preached concerning 'Signs of the End of the Age' as recorded in Matthew chapter twenty-four. In verses 36 through 44 Jesus clearly states that only the Father knows at which time he, Jesus, will return. Those who attempt, in any way, to set a date for the return of our Savior are deceivers of God's word. Christians learn from this passage that we are simply to be ready and watching for his return at all times regardless of how close to the end of this age we are living in. The William Miller movement and the subsequent founding of the Seventh-day Adventist denomination ignored the warning by Jesus to not set a date for his return. The Investigative Judgment doctrine is nothing more than a man-made theory unsupported by Scripture intended to give meaning for the failed return of our Savior. As such it is something false given to make William Miller's error appear to have meaning. Ultimately the original error still contradicts Scripture so defense of what is false can only be false. Ellen G. White also mentions "the Sabbath commandment" in today's lesson quote. While we have already mentioned one problem with the 'Sabbath keeping' practice of Adventism there is another point to consider, which has to do with the Adventist concept of the 'eternal moral law of God'. We must remember that the Old Mosaic Covenant and the laws contained within this covenant applied only to the Hebrew people. Only if you were a Jew or became a Jew would this covenant and the laws within it apply to you. Furthermore, all the law, whether or not it was found within the Ten Commandments or the rest of the law of the first five books of the Old Testament is all one law. Scripture does not separate the 'moral' law from the rest of the Old Covenant law. It is all one law. Therefore the answer to the question of Christian obedience to the Old Covenant law must be either it all applies or none of it. Ellen G. White is wrong about the Sabbath because it is part of the law that does not apply to those whose sins have been covered by the shed blood of Jesus Christ. When Jesus said "this is the new covenant in my blood", 1 Cor. 11:25, Luke 22:30 & Matt. 26:28, we learn that the New Covenant replaced the Old Covenant given to Israel. The 'written code' is all the laws found in the books of Moses, the first five books of the Bible. The 'written code' of the Old Covenant was replaced by the 'law of the Spirit, Romans 8:1-2. Jesus is our Sabbath Rest, Heb. 4:9-10 & Col. 2:13-17. There is no such thing as "Sunday Keepers" because Christians, both Jew and Gentile alike, worship Jesus Christ who is our Sabbath Rest in spirit and in truth. Copyright 2015 BibleStudiesForAdventists.com. All rights reserved. Revised July 24, 2015. This website is published by Life Assurance Ministries, Camp Verde, Arizona, USA, the publisher of Proclamation! Magazine. Contact email: BibleStudiesForAdventists@gmail.com.